Equities are very sensitive to interest rates given their cash flows are potentially perpetual. That means that declines in interest rates (spot rates and forward rates) is a tailwind to stocks due to the way cash flows are discounted back to the present. The sum of this series of sequential calculations represents their prices at the most fundamental level. A big risk to equities is that there’s no more tightening priced into the curve. That means the Fed can no longer just hike more slowly than what’s priced into the curve, but must actually cut to achieve the same effect on asset prices. The forward fed funds curve is flat to slightly down through the remainder of 2019 and then begins declining, pricing in a cut. The same is true for the eurodollar, with a 4-bp spike on the Dec ’19 maturity, and a 15-bp compression priced in relative to current levels by mid-2021. For US Treasuries, you have a 30-bp spread between the overnight and 10Y, which is a little bit but not much. Rates are no longer a tailwind. Once money market curves start going flat and pricing in declines, that cushion is gone and it’s a sign that your upside isn’t as high because rates are priced into the term structure of all assets and permeates into all asset classes. With that said, markets can be impacted on a day-to-day basis by any number of exogenous variables. Here are some idiosyncratic factors that can provide upside to stocks. Lower tariffs, depending on the elasticities of the goods involved, create more demand. This means more transactions and more revenue. The amount that flows to earnings gets discounted back to the present and that’s the implied effect on stock prices. When there’s a “trade announcement” and stocks move, it’s the collective change in those calculations. The Fed is coming up with a concrete plan that will be communicated in March, so this should be priced in rather than a source of volatility induction as people stop speculating on what’s going to happen. Apparently, the run-off will be stopped at the end of Q3. My personal opinion was mid-Q2 to early-Q3 due to technical considerations involving keeping sufficient bank reserves available to effectively operate the Fed’s floor-with-sub-floor system. But regardless of the exact timing, halting that is positive. 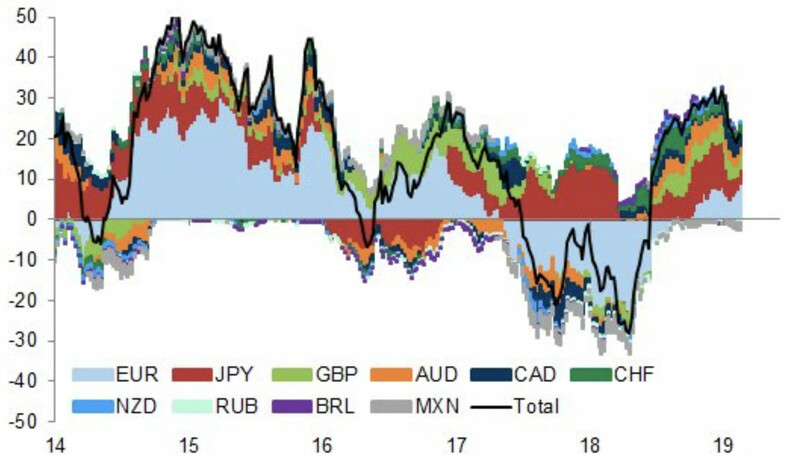 USD spec positioning is high. Dollar/stocks don’t always have a clear correlation, but a weaker dollar helps to ease financial conditions. It is often good for corporate profits. Companies can export more and consumers have less purchasing power to buy from abroad. Fixed-rate debt also becomes easier to service. For debtors, a weak dollar can effectively be a rate cut of some form, but is dependent on how their assets are affected in conjunction. So a weaker dollar – which will happen in the long-term due to intractable twin deficits, but not necessarily in the short-term – can be stimulative because it makes certain things cheaper. Corporate debt is high, but on a net basis, companies have cash. This gives them the opportunity to buyback shares, even if they are not necessarily cheap. Typically, for the mature phase of a business cycle upturn, opportunities for rapid growth through organic investment opportunities dwindle. In order to hit ambitious EPS targets, companies are more likely to turn to financial engineering. Namely, they are likely to restructure their capitalization and/or operations. The latter often is achieved through mergers, acquisitions, and/or divestitures. Companies can expand profit margins by shedding less profitable operations or by achieving improved economies of scale via M&A. Consequently, as the underlying growth of pre-tax operating income slows in response to an aging recovery, M&A activity should rise. There’s a reason why the top in M&A cycles (in total dollar volume) roughly accorded with tops in the previous two business cycles (Q3’07 and Q1’00). Total dollar M&A volume as a percent of US market value of equity is generally 11%-12%, though can get up toward 18%-20% late cycle and sub-5% early cycle. Nonetheless, the notion that the US market can be propped up through these measures interminably is untrue. Buybacks and M&A activity are not always value creative and are often value destructive. Buying pricey shares and making acquisitions at high premiums are common strategic blunders during the late phase of the business cycle. With no real tailwind from rates and slowing growth, equities cracking higher levels will become progressively more challenging. Moreover, margins in the US peaked in 2017 and are now declining. Without margin expansion, earnings growth becomes increasingly dependent on revenue growth. However, forward indicators show that spending growth will decline – as in still growing on an absolute basis, but negative on a rate-of-change basis. 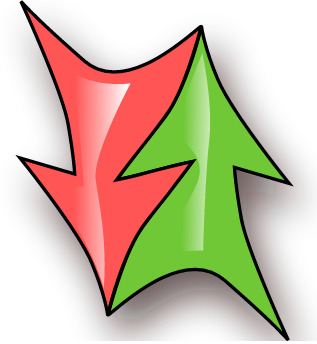 Risks are asymmetrically skewed to the downside.